My Brother In Law found a tiny gray kitten in the middle of the road yesterday. 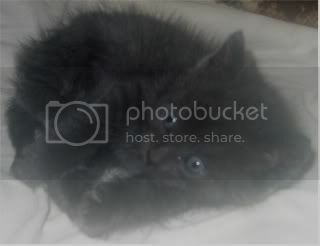 You can probably guess who has it now, because we really need another kitten. He is solid gray and scurries around like a mouse so we named him Mouse. 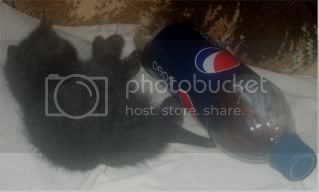 Mouse next to a 20oz Pepsi bottle. 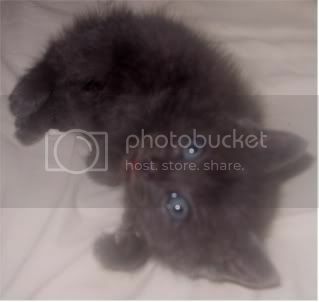 Somehow, I could hear the facetiousness in your 'voice' when you said you need a new kitten. Oh, my, how tiny!! It looks too young to be away from it's mama! It is precious, and Mouse suits it. He probably should still be with his mother, but he is eating on his own. Since we already had 16 cats we really did not need another one. Kibbie's dog has adopted him. She will follow Mouse everywhere. Ebony even growled at Recee, one of her buddies, when he got to close to Mouse. Ebony is driving the rest of us crazy. When we hold Mouse Ebony will jump in our lap to make sure Mouse is safe. I WAS going to suggest giving him to Kibbie as a responsibility training aid. He's adorable. SOunds like Ebony thinks he still needs a mommy! Can you get a picture of the two of them together? 16 cats??!! So now that's now 17??!! Sounds like a houseful of crazy cat ladies! You named him mouse; my wife is a Mickey Mouse nut, so she named her big grey cat Mickey and her calico Minnie. Anyway, he looks like a cutie. Kibbie already has a cat, Two. Our camera was dropped last night and no longer works, so no pic. of Mouse & Ebony together. Sorry. I was counting her as one of the crazy cat ladies. Looks cute indeed, and you coudn't very well have left a cute kitty eh? And as you said, you definitey needed abother one because that number would get you nearer 20, right? Yeah because everyone should have 20 cats. BTW no matter what Mouse or anyone else thinks he is not mine. He belongs to the house hold, not me personally. Lately every time I get a cat it dies. So Mouse is not MINE. Now I just have to convince Mouse of that.